Most procedures performed by a High Frequency Desiccator utilize ten watts of power or less. The Derm 101 and Derm 102 are economical, 10 watt high frequency desiccators, thoughtfully designed to give practitioners the ability to perform in-office, minor skin procedures such as the removal of skin tags, benign lesions and premalignant lesions. These Bovie units allow practitioners to provide better patient care in the office, at a sensible price, saving the patient time and money, while increasing their practice revenue. The Derm 101 High Frequency Desiccator offers ten watts of monopolar power, adjustable in 1/10th watt increments, to desiccate and fulgurate tissue. The power can be adjusted using the 3-Button Power Control Handpiece (A902) or using the rotary dial on the unit. The unit features a large, bright, LED display for excellent visibility across the procedure room. If foot control activation is preferred while using the Derm 101, just plug in the A803 Bovie Footswitch (sold separately) and activate. 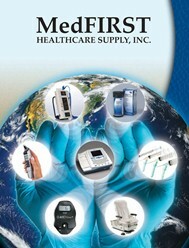 No separate handpiece is required. 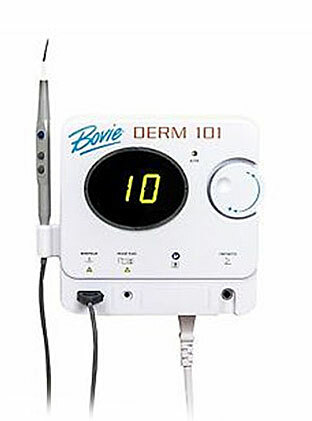 For the practitioner utilizing bipolar electrosurgery, Bovie offers the Derm 102 High Frequency Desiccator with 10 watts of bipolar power, adjustable in 1/10th watt increments. To utilize this feature the A827V* bipolar cable, a bipolar forcep* and footswitch activation are required. The Derm 101 and Derm 102 are packaged ready to use. The units come with a total of 18 disposable dermal tips. By the time the practitioners utilizes all 18 electrodes, they will have paid for the unit, twice, and generated income for their practice.